THREE guides are celebrating after scooping the highest award a guide can achieve. Julia Crane, Erin Luke and Elizabeth Pulsford from the 25th Kingswood (Christchurch, Downend) Guides were presented with their Baden Powell Award by the Division Commissioner for Kingswood North. The presentation was attended by families and friends of the girls including all the other guides in the unit. 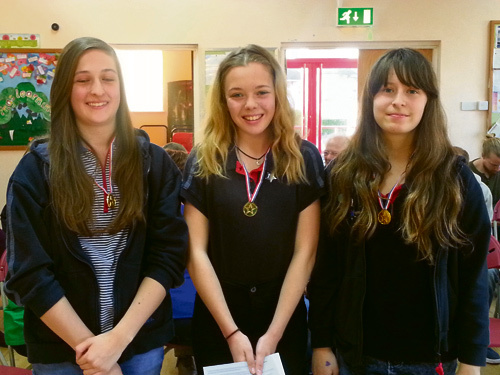 The girls, who are all aged 14 and live in Downend, worked hard to complete the 10 challenges necessary for the award. They attended the Big Gig, raised money for Comic Relief, slept outside, visited a pet rescue centre, planted bulbs for Downend and Bromley Heath in Bloom and still made time for some relaxation. Their final challenge, the Baden Powell Adventure, took them to Bath where they spent the night at the Roman Baths.